Termez is the most southern city of Uzbekistan, located on the right bank of the Amu Darya River, 490 km south-west of Tashkent. The city's population is 150,000 inhabitants. There is the only "Friendship Bridge" on the state border between Uzbekistan and Afghanistan near Termez. Unfortunately, the sources of the date creation of the old Termez were not preserved. In the VI century BC the city became part of the Achemenids, who called it the ancient city. In 329 Termez was conquered by Alexander the Great. During the reign of the Kushan Empire the town was known as Talimi. This period Termez became an important center of Buddhism. In V-VI centuries, the city was captured by ephtalites, Sassanids, in the VII century there was ruled termezshah dinasty, and in 705 the city was attacked by the Arabs. In IX-XII centuries Termez became a major city, trade, cultural and scientific center. In IX-XII centuries Termez was a part of Gaznevid, Seljuk and Karakhanids. In 1206, the city was dominated by the state Khorezmshahs. In 1220 the city was destroyed by the troops of Genghis Khan. In the second half of the XIII century Termez was restored and was a member of the Timurid state, later it was under state ownership of Sheibanids. 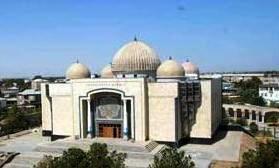 There were built minarets, mosques, prospered science, culture and art. The remains of city walls, the Buddhist religious cave complex of Kara Tepe (II-III c), complex Fayaz-Tepa, the remnants of the feudal city of the IX-XII centuries, Mazar – place of pilgrimage (mausoleum) of Khakim at- Termezi (XI-XV centuries. ), the unique building Kirk-Kiz ("forty girls"), the ansamble of mausoleums of Sultan-Saadat (XI-XVII cc. ), Kokidor-Ata mausoleum (XVI century), Djakurgan minaret (1109), Archeological museum of Termez, and many Muslim and Buddhist buildings of different epochs are very interesting sights. In 1999 there was accepted the decision of the 2500th anniversary of Termez. 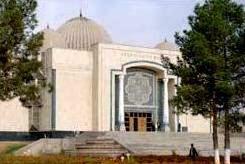 April 2, 2002, one of the most ancient cities of Uzbekistan Termez celebrated its 2500th anniversary.